Eleven delicious stories! 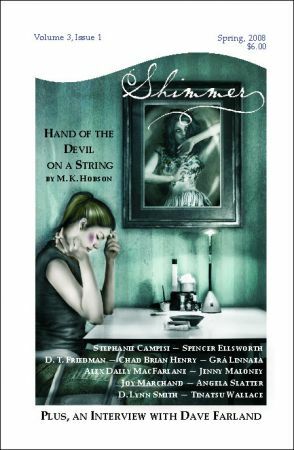 Our cover story is M. K. Hobson’s “The Hand of the Devil on a String,” which appears on the Best American Fantasy 3 Recommended Reading List. Four stories from this issue were selected as Honorable Mentions in Ellen Datlow’s Year’s Best Horror: “The Hummingbird Heart,” by Angela Slatter; “The Shape of her Sorrow,” by Joy Marchand, “The Hand of the Devil on a String,” and “Chimera and Qi,” by Tinatsu Wallace. We’ve also got a Lucy cartoon from Chrissy Ellsworth, and an interview with Dave Farland. Beneath the glossy cover art by Aunia Kahn, the 2008 Spring issue of Shimmer is filled with illustrated stories loosely based on relationships, and how the power of love or the lack of it influences people’s lives. This issue will satisfy the widely diverse palates of fantasy readers. –The Fix. I’m supposed to be thankful for that. I can tell by the way she glances sideways at me from across the kitchen table, her lips tucked into a self-satisfied pucker. Already I regret coming here, but I say nothing. I am not the monster she thinks I am. The tiny bird lies quiet in my hands; not tranquil but quiet. I can feel it vibrate against my palms and I think, this will be good for my purpose. I keep the fingers of one hand over its sharp black eyes, and with the other I feel the detail of its feathers, the infinite intricacies of its design. I gently place the bird into the cavity in my daughter’s chest. White and black. Mathilda had no other shades, not really. She wore a long black dress that draped to her ankles. A widow’s peak, as dark as any great depth of the ocean, pointed at the center of her forehead. Half of her face smiled, the black lipstick bringing the corner of her lips upward. A tiny black dot, a dimple, graced the smiling half. The other half frowned, perpetually sad. A black tear fell from the inside of her eye, trailing along the side of her nose, ending right before the black frown of her lip. Gathered secretly from the cold tiles of our kitchen floor, held like eggs a-nesting in my sister’s finest silk handkerchief: my bones. Long and fine, criss-crossed by cutlery marks, pale in the moonlight as she placed them on the soft earth, as she tugged away grass and dirt, tears drip-dripping from her cheeks. With a whispered apology, she gently lowered my bones to the small hole and piled the earth back on top. Maya’s story begins the day a coachwhip snake raced up and bit her mother on the calf. The bite swelled until seven days later, Maya burst through her mother’s skin. Within a matter of days, she was walking and talking. Her mother didn’t think towonder how this could have happened. But she was relieved and thankful that she didn’t have to breastfeed or change a diaper. The man stood in the doorway streaming rainwater, cradling a woman wrapped ankle to crown in a wedding quilt. A tangle of wet blonde hair spilled from one end of the bundle, a pair of sock feet from the other. The socks were green and red, with a pattern of candy canes. On Thursday, after her four o’clock client had left with ten nails shining Pomegranate Desire, Seff found Mrs. Dee sitting in one of the molded plastic picnic chairs at the front of the Venice Nail Salon. The old woman was all dressed up, in a flower-print rayon dress and a black straw hat with a frowsy silk rose. Her thin lips were clenched like a fist. She stared through the front window, watching the empty street, and her hand hovered at her throat, at something black that hung there. Mrs. Dee’s appearance at the Venice Nail Salon was as unexpected as it was unpleasant. It was my parents’ anniversary and I wanted to get them something special, something to distract them from criticizing me, their twenty-year-old failure. I searched far and wide for the perfect gift, scouring our town. My search lead me to an ancient Moldovan shop where I bought a perfect gift book. The book itself was to be the present but upon perusing it, I found ap assage that suggested that the best gifts came from your own backyard, so I dug a hole. Under our perfect lawn, I found a caveman. Nef towered over Tabor, cup tipped as always. The drop he had spilled at the birth of the green generation had almost reached his waist. The drop he had spilled before that was turning into a bird and would, in time, followthe frozen flock of its brothers toward the ceiling. Tabor studied the transforming drop-bird, her expression unreadable. A song plays on the jukebox–a song that hasn’t been written, sung by an artist that hasn’t been born. If I could force myself to pay attention, concentrate for just a moment, I’d realize I’m traveling through time again. But there’s a distraction: a woman entering the bar. She’s tall and pale around the eyes, blowing off her Monday morning hangover with perfume and gum. There once was a girl made of glass. She walked with fragile, jagged steps, and everyone she touched wept long lines of red from their skin. When she smiled, it was reserved, as she feared her lips could so easily shatter. Because she was made of glass, people would either look straight through her, their eyes opening up her secrets and toying with them, or they would look straight past her, as though she did not exist at all. Once, someone smashed a wide-mouthed green bottle in front of her, and deliberately crunched it under his boots, and she ran, crying, to her home of windows. Previous PostTemporarily closed to submissionsNext PostFree Pirate Booty!